← Roads are slippery when wet (or covered in snow)! Veterans account for approximately 9.5% of the adult U.S. population. This equates to 22 million men and women between the ages of 20 and 65. Not all of them are looking for work, but a disproportionate group of veterans from the Iraq and Afghanistan conflicts are and we need to help them find jobs. It is the least we can do for those Americans who put their lives on hold to protect and defend our country and Koons wants to help. While millions of veterans have transitioned out of the armed forces over the last ten years, the number of post-9/11 veterans transitioning from active duty service to civilian life will significantly increase over the coming years. 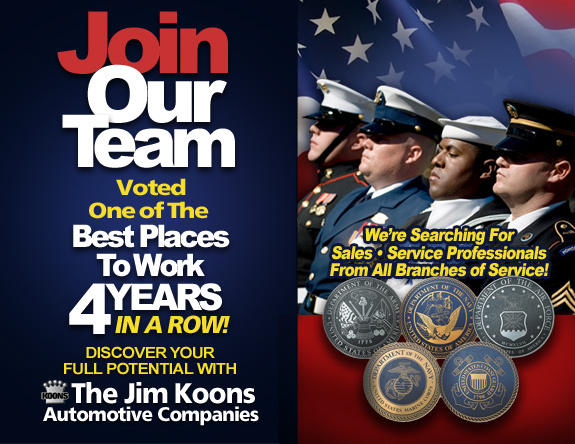 Koons Automotive, in concert with Hiring Our Heroes program, is committed to hire top talent from our armed forces. Koons is joined in this effort by many other business and government entities—non-profits, for-profits, civic organizations, institutions of higher learning, community-based efforts—we’re all committed to assisting veterans as they transition out of the services and pursue civilian careers. Tom Donnegan, Director of Training and Recruiting for Koons Automotive Company stated, “Koons typically likes to hire former military because they’re very disciplined, hard working, tech savvy, friendly and organized and in this business that’s the skill set needed for success.” Working in the automotive industry requires a wide variety of skills, not the least of which is good people and listening skills. Employees that have been hired in the past that came from the military have excelled with us because of that. Maintain knowledge of inventory, features, accessories, etc. If you’re part of the military and you want to join a progressive challenging and supportive company come and see us online at Koons.com or at the career fairs at Fort Belvoir on Feb 19th or at Verizon Center April 9th. Contact Tom Donegan directly. Good luck in your search and thank you for serving our country. Posted on February 5, 2014, in Automotive and tagged Jim Koons, Koons, Koons Automotive. Bookmark the permalink. 1 Comment.